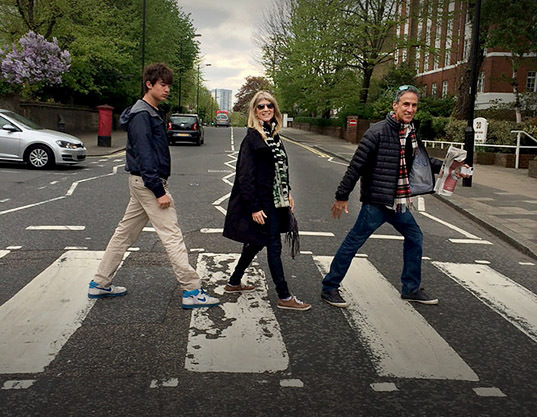 LONDON, England — Aidan, Tiffany and David Oestreicher posed for a recreation of the Beatles album cover in London on Abbey Road. Says David, to get to the location, get off at the St. John’s Wood tube station, and walk a few blocks. The Oestreicher’s daughter, Bibi, was supposed to be Ringo, but traffic was heavy that day, and she declined. The Abbey Road crossing, near Grove End Road, was made famous in a photograph made 43 years ago this month. Photographer Lain McMillian spent about ten minutes photographing the Beatles for their album of the same name. The Beatles recoded the album at the studio on the now famous street. It’s become a destination for fans of the band, and on any given day, in almost any type of weather, hordes of fans can be seen risking life and limb and holding up traffic to recreate the scene.